Are our rights online under threat by our own governments? What real and imagined dangers face citizens at the online-offline nexus? Watch the wide-ranging panel discussion which launched openDemocracy's new 2016 partnership, 'Human rights and the internet'. 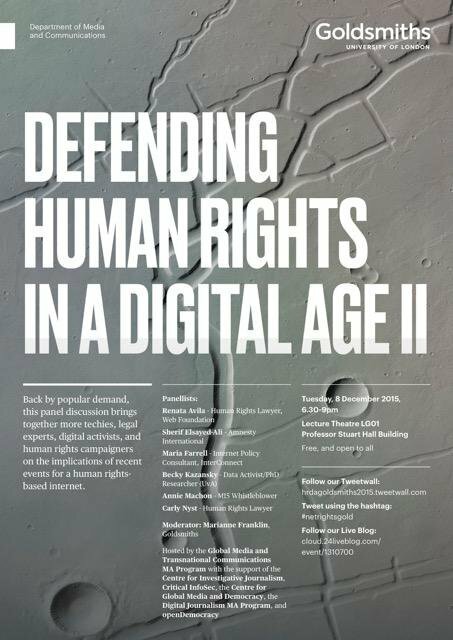 This was the second edition of "Defending Human Rights in a Digital Age" continuing the conversation from earlier in 2015. A lot had happened to raise the stakes and reveal the increasing divergence between the way governments and corporations expect to gather and retain large databases ("Big Data") and mounting calls for greater protection of civil liberties online. Future decisions about internet design, access, and use now have to take account of the digital dimension to war, terrorism, migration flows, and refugee movements. Panelists discuss the shifting context in which politicians, activists, and researchers perceive the challenges and opportunities for a rights-based and sustainable internet. They are also still grappling with the implications of the Snowden revelations on how the media, political institutions, judiciaries, and businesses respond to debates around "internet freedom", "cybersecurity", privacy and freedom of expression online, and concerns about the concentration of internet ownership and control in the hands of a few. What are the real and imagined dangers facing citizens and their political representatives at the online--offline nexus? How can rights-based approaches to decisions about internet design, access, and use make a difference? Are our rights online under threat by our own governments? Is there a trade-off between civil liberties and national security online? Is it time to stop giving away so much information when we use commercial social media? Are encryption and obfuscation forms of resistance or compliance? If we cannot trust our own governments to protect our rights and fundamental freedoms online then should we trust corporate service providers to look after our personal data instead? These questions and more were up for discussion. Here we publish too small clips from the debate, as trailers for the full panel debate to come shortly. Forum editor and moderator: Marianne Franklin, Professor of Global Media and Politics at Goldsmiths - @GloComm, University of London, gives her inaugural lecture on February 2, 2016. In the run-up to this event, look out next week for openDemocracy's seven-part serialisation of "Championing Human Rights for the internet - why bother? ", beginning with Part One,"Coming in from the cold" this Sunday, 31 January. We hope that this comprehensive overview of the issues on the front line will persuade you that it is worth bothering, since we are about to launch our online forum on 'Human rights and the internet' which will address these concerns over the coming year, by bringing together a range of views from legal experts, h/activists, scholars, computer and security experts, intergovernmental policymakers, political and business representatives. We want to provide a space for deepening ongoing debates, discussing new issues, raising awareness and exchanging information about the institutional spaces in which internet policy decisions take place. So, we will address these concerns from a range of perspectives along three broad axes; controversies, actors, and institutions. We invite readers to take part in 'Human rights and the internet' and look forward to lively debate and an exchange of ideas and knowledge about topics that concern us all in an increasingly internet-dependent world. Watch this space. This series of events is hosted by the Global Media and Transnational Communications MA Program with the support of the Centre for Investigative Journalism (CIJ), Critical InfoSec, the Centre for Global Media and Democracy, the Digital Journalism MA Program, and openDemocracy.